"I think normal is what life looked like five minutes before I slipped on the ice." How horrible it had to be to wake up with false memories! This is exactly what happened to Lucy Sparks. Lucy had everything going for her. She had a great relationship with her boyfriend Matt Newman. She had a great job and she was happy with her life. Then she falls on the ice and suffers a severe trauma to her head and in one second she losses it all. When Lucy wakes up in the hospital, she discovers that the man next to her bed, her friend and co-worker Matt is actually her live-in boyfriend but she doesn't remember anything about her relationship with him. Instead, she remembers her ex-fiancee Daniel London but she remembers him as her husband. She remembers everything about her wedding even though, her parents assured her it never happened. She hasn't even seen him in four years! Lucy feels so confused and every time, she is close to Matt she feels like she's cheating on Daniel. It breaks her heart and Matt's too. For his part, Matt is determined to help her try to remember by recreating some of their special moments. The Life Lucy Knew broke my heart. I felt bad for both Lucy and Matt. They were served with a rotten deal. Matt was so sweet and patient but I also understood how terrible it was for Lucy. She was feeling a sense of loyalty towards Daniel, a man whom she believed to be her husband. She had trouble recognizing which of her memories were true and which were false and created by her own mind. "Feeling like you're a passenger in a car, versus the driver." 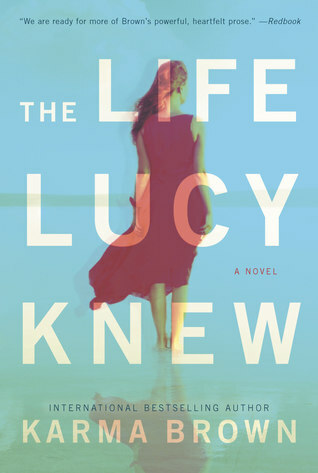 I couldn't put down The Life Lucy Knew, I HAD to know how the story was going to unfold. Her unique situation forced her to make new choices. I NEEDED to know which road she was going to follow. I won't lie, I was rooting for Lucy and Matt the whole way through. He was so easy to like and fall for. Rooting for Lucy was not difficult. She had to question everything in her life and have the courage to continue onward with her new life since she wasn't sure her memories will ever come back. With the Life Lucy Knew, Karma Brown has created a new fan in me. A complimentary copy was provided by Harlequin via Netgalley in exchange for an honest review.